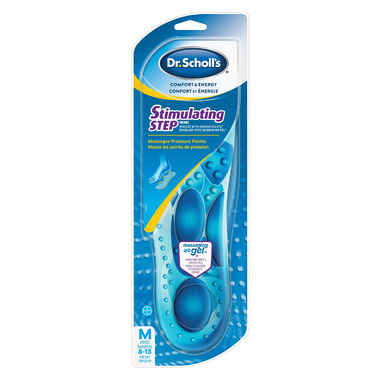 Dr. Scholl’s® Massaging Gel® Stimulating Step™ Insoles have stimulating nodes and comfort pads to target pressure points on your feet for a massaging action. Help to reduce fatigue in feet and legs, and allow you to stay on your feet longer. Ultra-soft blue gel provides superior* shock absorption where you need it most. Firmer purple gel provides added support. *versus not wearing insoles.